A supermarket ad containing mostly fresh produce but that contained butter, bacon, and jam was banned after London’s Mayor Sadiq Khan introduced a prohibition on advertising ‘junk food’ on the Underground. Online food retailer Farmdrop, which aims to deliver “fresher, fairer groceries,” has claimed that Transport for London (TfL) rejected their advert because it contained items including “free-range eggs and butter from local farmers” in contravention of the war on “high fat, sugar and salt” foods. 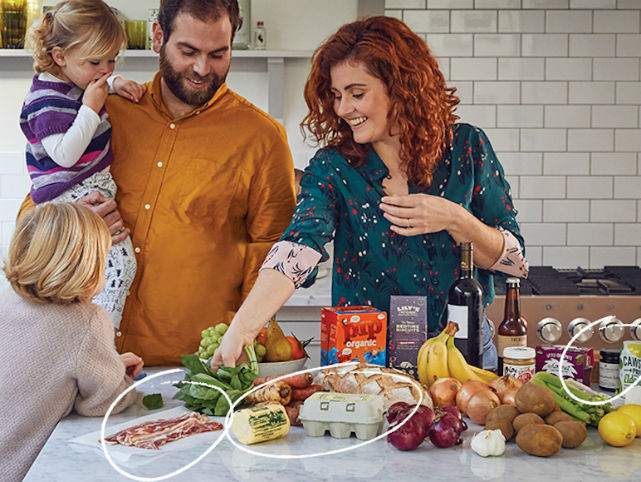 In a blog post, the fair-trade shop shared the original poster (above), highlighting the offending items that it said had to be removed before the ad was approved by TfL: rashers of bacon, a jar of strawberry jam, free-range butter, and half a dozen free range eggs. Farmdrop said that they supported “preventing brands from aggressively advertising junk food to children,” but they were “surprised” by the heavy hand taken against their ad that also featured fresh fruits and vegetables being arranged by a healthy-looking family in a kitchen setting. “While the ban is coming from the right place, it’s handling has been clumsy. We know this because our latest campaign on the tube network has been rejected. Why? Because our Farmdrop posters include so-called ‘junk foods,’” the company wrote. “We were told by TfL’s sales agent, Exterion, that these foods were not ‘high fat, sugar, and salt (HFSS) compliant’. “We ended up cropping the photo but even this wasn’t compliant with the new regulations,” they added, before they claimed they had to trim the image again to exclude the offending butter, after censoring the jam, bacon, and eggs. TfL told the BBC that it is up to advertisers to make sure any food items featured were “HFSS-compliant,” and denied that they had ordered the eggs in the cull. “I’m proposing to ban adverts for harmful junk food from our entire Tube and bus network. I want to reduce the influence and pressure that can be put on children and families to make unhealthy choices,” Mr Khan had said in May 2018.